At St. Agnes we know that when we each study, play, create, write, speak, serve, preach, and pray with our whole and authentic selves, we can all contribute more—more peace, more positivity, more service, more humility, more compassion, more curiosity, more ambition, more impact, more change. And that means our young women are (more than) ready to pursue lives of truth, passion, and purpose. Rooted in the Dominican tradition, St. Agnes Academy provides a Catholic college preparatory education that encourages young women to develop intellectual curiosity, to work for social justice and to act with integrity and compassion. Our expert faculty members enter into equal partnership with their students—establishing a covenant of authentic, wholehearted learning that far exceeds the traditional classroom experience. Whether in speech class, a peace and justice seminar, an astronomy or anatomy lecture, our students seek more than the superficial answer—the why behind and the truth within each lesson. St. Agnes is a dynamic community of believers: our students come from many walks of life and faith traditions. And yet each and all come to embody the timeless and universal teachings of St. Dominic—courageously pursing truth and humbly practicing compassion, love, and justice through(out) their lives. At St. Agnes Academy, creativity takes the form of a constant challenge: be curious, know more, question more deeply. This kind of creativity isn't limited to any particular medium. Our students write compelling documentaries, curate their own art shows, and build imaginative stage sets. Guided by our always-encouraging teachers, each St. Agnes student finds and hones her ability to express herself. For more than 100 years, St. Agnes has empowered young women to develop intellectual curiosity, to work for social justice and to act with integrity and compassion. Academy women are leaders and are making a difference in the world today. Since our early years on Fannin Street, we have been blessed with faithful partners like you who support our mission. Your generous gifts continue to keep our doors open, our tuition low, provide for campus improvement projects, enable professional training and education for our teachers and staff, and give us the ability to award student scholarships so that more young women can attend the Academy in our second century and beyond. 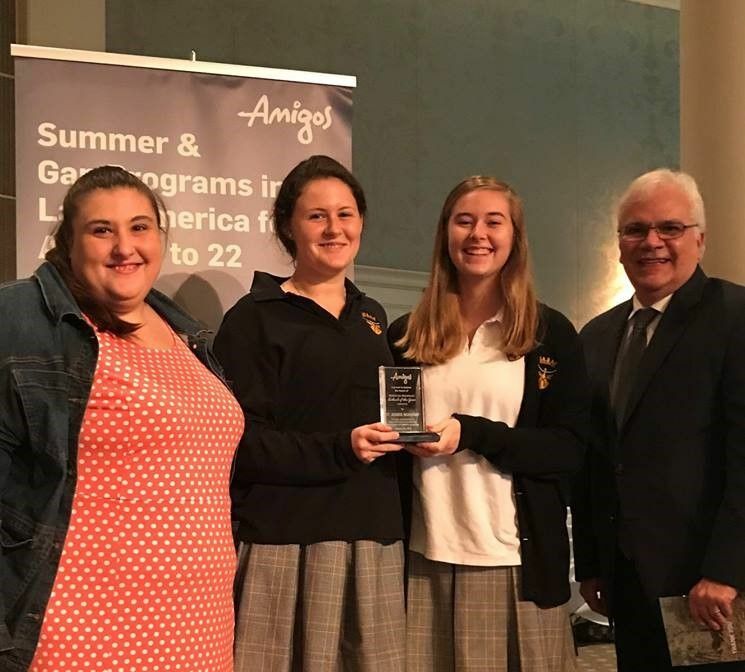 Krystle Powell and Alvaro Rodriguez attended the Amigos de las Américas annual Houston Breakfast where we received “The Houston Breakfast School of the Year Award” for our commitment to international service learning and support of the Amigos program. The World Languages department and Campus Ministry were recognized for preparing students culturally and linguistically to be successful volunteers in Latin America. In the last five years, 36 of our students have participated and completed summer programs in Costa Rica, the Dominican Republic, Paraguay, Panama and Ecuador to mention a few of the countries. They said that St. Agnes has been a partner “for as long as they can remember” and sends more students through the amigos program annually. Servant Leadership is the Capstone Service Experience for Academy Juniors and Seniors. In their last years as Academy women, students must choose one organization that works directly with the most vulnerable in our world. Students spend 100 hours with that community, growing in relationship. This immersion experience requires students to align themselves with the marginalized and to work for sustainable change in the Houston community and around the world. This is why AMIGOS so perfectly fits with the mission of St. Agnes and the Servant Leadership experience. We are honored to continue partnering with AMIGOS.